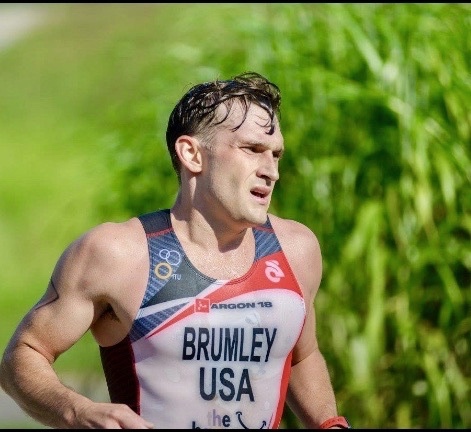 Welcome pro triathlete Adam Brumley, from Buckhannon, WV, to the Luray Triathlon! See our interview with Adam below. Currently, I am working at Davis Medical Center in Elkins, WV. My time is split working in the Nursing Department and Cardiac Rehab. When the time is right, I will be applying to medical school. I have always been a multi-sport athlete throughout school. It was not until college, that I decided to focus on swimming full time. This decision was based on the fact that swimming, at the time, was the most difficult sport. 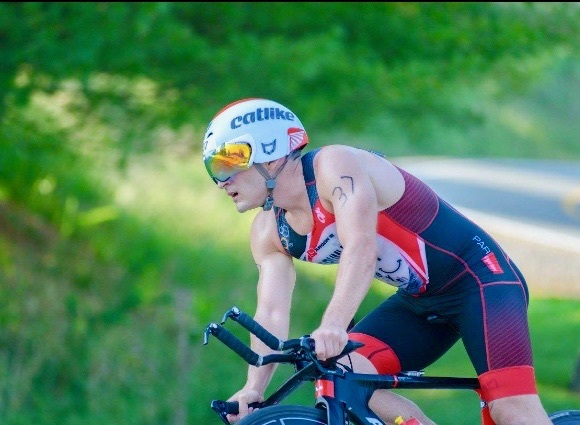 I completed my first triathlon my junior year of college, it was a sprint, in which I had won and caught the “triathlon bug.” From then to about a year ago, I had been doing races, on and off, seeing a steady and inspiring growth in the sport. Last year, was the first year in which I had actually decided I would train year-round for triathlon to see what I could do. At the end of my season last year, training had paid off, and I had earned my pro card. With this only being my second year focusing on the sport, I learn something new everyday to help me improve. The most important thing I have learned is to balance work and training with my social life. With that being said, in my free time, you can find me out and about with friends and family enjoying life and living in the moment. I am not one to take credit for anything I do. For me, this is a team effort. From the athletes I have coached, to the people that support me, to the people I train with, they all inspire me to keep going and progressing. One of my biggest supporters, my grandpa, unfortunately lost his battle with cancer earlier in the year. He continues to inspire me to be strong and keep going, so I strive to continue to make him proud. My life has changed since I have started triathlons. Triathlon has helped me with depression management. It has provided me with a positive outlook on life. Training sessions have helped improve my mental capacity, making me become one with myself. Q. What helped you decide to do Luray? A few training partners had suggested I check out the race. So naturally, I looked it up and read some reviews. The decision to do this race, from everything I had read and heard, was easy to make! Q. Have you ever completed a double before? How are you feeling about it? I have never completed a double before, but racing like that sounds fun and provides me with valuable feedback on how well training is going. With that being said, I am excited to see how it goes! Obviously, some goals are to do well and see what I can do, but most importantly is to come down and enjoy the atmosphere and camaraderie from everybody. To me, this is one of the reasons that make this sport so great. Q: What advice would you give to any aspiring triathletes? No matter what your goals are, whether you are racing to compete or doing triathlon as a way to improve your overall health and well-being, remember to have confidence in your training and enjoy what you do each and everyday. The ultimate goal is to be the best I can be day after day. We are going to continue to train hard and look at potential sponsorships. On top of everything, we are just getting started so the sky is the limit!